Are you looking for the best Engineering & Drafting CAD Software? Our solutions suit professionals like you that are involved in commercial, food & beverage, petrochemical, biotechnology, heavy industry, marine, mining, military, pharmaceutical, pulp & paper, energy generation or similar type of industry. If you require easy to use engineering software to get the job done right and quicly, then we have the solution you are looking for! We have software products for a wide range of engineering applications ranging from Mechanical software, Piping software, HVAC Ducting software and Structural Steel Detailing software. Our engineering suite will run inside a wide range of CAD software including AutoCAD, Bricscad, CADian, GstarCAD, progeCAD and several other IntelliCAD versions. If you are like most draftspersons you know how hard it is to meet deadlines. Automating your workflow is essential in order to keep up with hectic schedules. Our engineering tools makes it really easy to get going. Even non-technical users will be able to easily use our menus and dialogs without having to draw a single line. Each Mech-Q CAD software offers a set of powerful 2D & 3D functions and utilities that makes your engineering design and drafting work easy and cost effective. Available separately or as a bundled and cost effective - Engineering Suite. 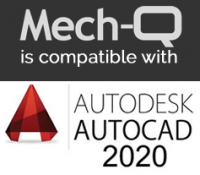 Mech-Q Mechanical CAD is one of the most useful software packages for a mechanical design engineer using AutoCAD® or similar CAD Software. This add-on application is a must for most mechanical engineering CAD professionals involved in all aspects of mechanical design or mechanical 2d and 3d drafting. This mechanical cad software module is also very useful for engineering and drafting professional involved in material handling. With Mech-Q Piping CAD Software, you can create, modify, and manage piping and instrumentation diagrams in AutoCAD® or similar CAD design software. This add-on to CAD, it is familiar to many designers and engineers. With simple design, reporting & editing tools for drawing piping layouts for all kinds of piping projects. The Mech-Q Piping CAD module is used piping professionals involved in process piping, pharmacutical plants, petrochemical plant design, nuclear piping, building services design. Pipe hangers, clamps, pumps, cylinders, tanks and several other piping software modules. Features include: Auto-BOM, auto-labeling and easy editing. Full control and customization of layers. Part of this piping software module is the database editor that allows you to change, add or delete pipe and pipe fittings to the existing comprehensive range. The Mech-Q HVAC Ducting Software module is a great tool for Ducting profesionals involved in Air Conditioning, heating and vetilation projects. Several Duct fittings included: Duct bends, transitions, tees & wyes, offsets, branches, dampers, diffusers, flexible duct. 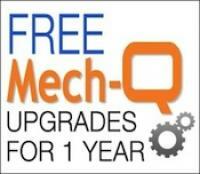 The Mech-Q CAD software supports both Metric & English (Imperial) Units.